iOmniscient’s systems are designed to work in a way that suits your needs. Our unique Artificial Intelligence Based Video Analytics Software will works with any camera, Distributed/ Edge or Centralized or Hybrid. Any system that is implemented in a busy city must survive and operate over a long period of time. It must be adaptable to evolving needs as the technology and the expectations of its citizens change over the years. The system must therefore have a flexible architecture which protects the city’s investment in hardware over the next decade and longer. 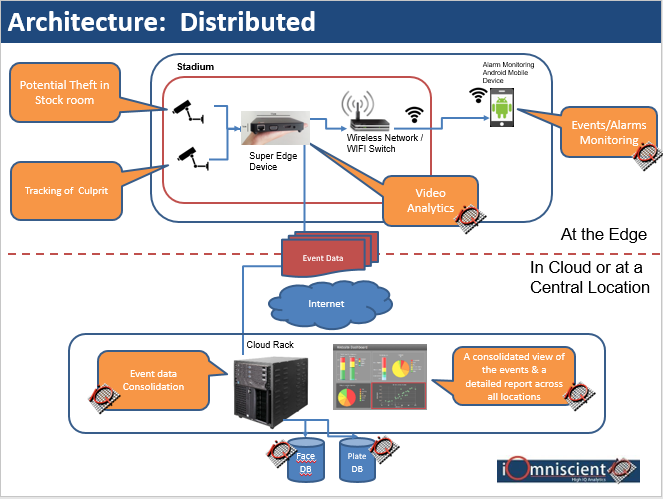 The hardware and network architecture for a Smart City can be Centralized, Distributed or a hybrid of the two. 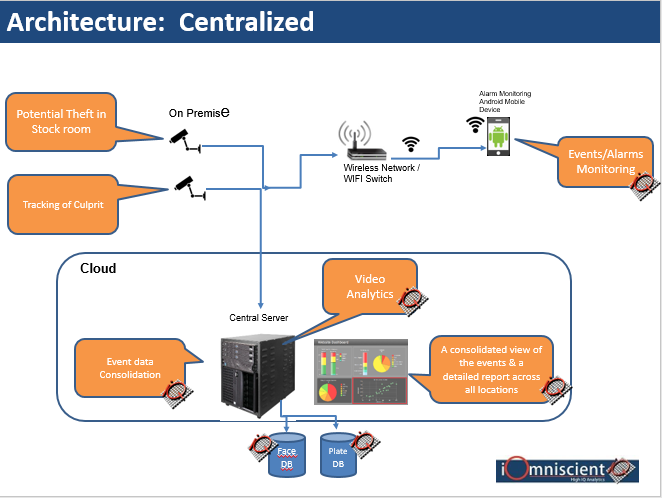 Centralized architectures are suited to applications in which all the information needs to be captured and stored for future retrieval. There are applications, however, in which it does not make sense to store all the data as it may impose a heavy load on the network. Examples of these are situations in which megapixel cameras are used. In rare incidents, it makes sense to only store the high resolution images from certain incidents centrally. All other information can be stored in a low resolution format. In these situations, the analysis can be done on a small computing device placed near or even inside the camera, known as computing at the Edge. Since a city is a very distributed environment, at least a proportion of the surveillance would best be done on Edge devices. These are essentially little computers that sit inside or near the cameras (at the “edge” of the network). The traditional Edge devices that have been available to date just do not have the power to provide all the computing required. Hence, iOmniscient, in partnership with Intel, has built a Super Edge device which has the power to process the analytics for 4 cameras at a time in a rugged device.